Finding our way back after Sandy; Jersey Strong and Loving It! When a family lost their beloved shore house to Hurricane Sandy it was more than just property destroyed. With years of wonderful memories and generations who were attached to the space, making the decision to knock down and build new was bittersweet as well as a major undertaking. I was fortunate to have been involved from the very start of this labor of love. As we walked through the destroyed home we recounted memories and consciously chose items to be repurposed in the new home. Some interior doors and a pair of leaded glass cabinet doors circa 1920’s were among the items we salvaged prior to demolition day. Partnering with a local architect (Ken Kwiecinski and Associates) and builder (Matt Crivelli of Crivelli Construction) of my client’s choice allowed us to plan the layout and design of the new home to perfectly meet this multi-generational family’s needs. A Great Room floor plan allowed for open concept living space on the main floor. 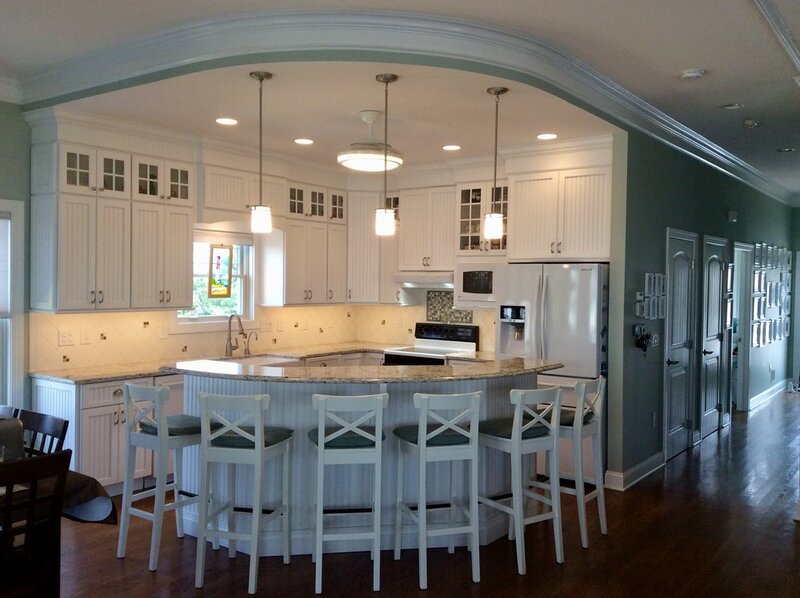 The bright white kitchen is defined by a dropped ceiling which follows the line of the custom island below. Purposefully planned fixtures throughout the space meet all the needs for ambient, task and accent lighting. The Living Room area is anchored with a large sectional sofa to maximize seating around the fireplace and TV wall. It is covered in a mid-range gray, high durability fabric for both comfort and practicality. 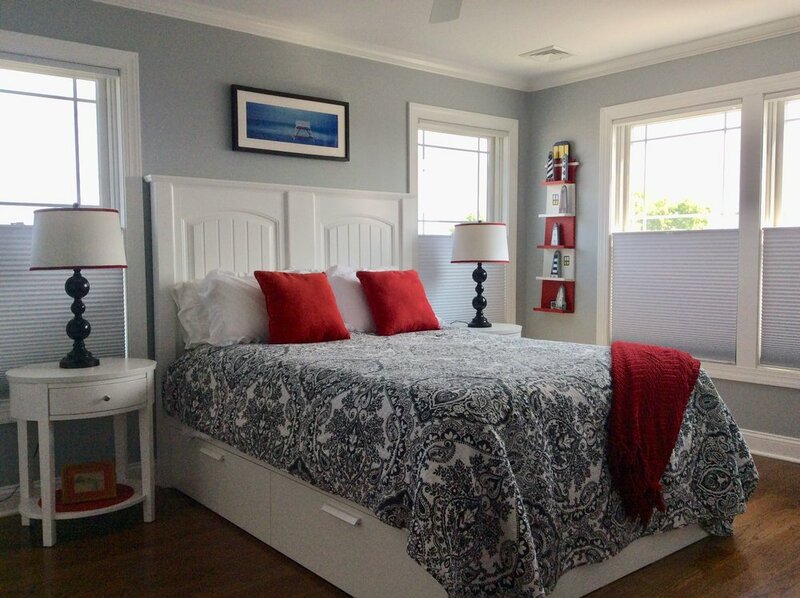 The choice of a chameleon like gray paint color in a lighter value (Sherwin Williams 6205-Comfort Gray) was the perfect neutral back drop allowing the bright white moldings and trim to pop. The addition of a custom (John Neves Custom Cabinetry) Bar and Beverage Center in the Living Room area moves congestion away from the kitchen and opens the flow for entertaining. This area is also where we were able to showcase our 90 year old leaded glass cabinet doors salvaged from the original house. Placing them in direct view as you enter the new house pays homage to the original structure and creates conversation. Early on in the planning process I discussed with my clients the possibility of choosing a symbol that will convey feelings and purpose. We chose the Compass Rose because of its nautical reference but also because it allows one to find the right direction. We then used that symbol throughout the house in small meaningful touches such as an inlaid floor in the sun room and the second floor hallway ceiling. As a family they chose a name for their new home and Summer Breeze Bay House was officially born. Going through decades of photos together and choosing specific ones for a memory wall helped to bring the past into their new home in a very positive way. The large high wall in the staircase was broken up and softened by applied molding panels but because of mechanical necessities a window was not possible for the stairwell. My client is an avid photographer so I tasked him with capturing the image of what would be visible if that window existed. Choosing one we all agreed upon, I had it applied to a canvas wallpaper which was pasted directly to the wall by my colleagues at Olympic Painting and Wallpaper. The addition of custom molding frames it for a view that is beautiful from all levels. Utilizing the salvaged doors to make custom headboards for several bedrooms was made possible by the talents of Tom Walsh Custom Carpentry and the results are fabulous as well as unique. For the Master Bedroom and Bath soft colors and clean simple lines were used with an emphasis on texture. The Master Bath with its luxurious shower is worthy of any 5 star hotel. This family is building new and happy memories in their new home. It is proof positive of the resiliency of the human spirit and the fact that once we find the right direction we can move forward with beautiful and functional results.